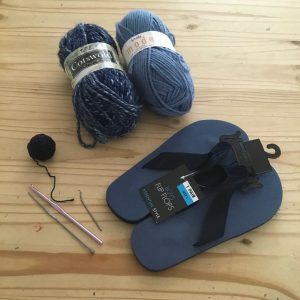 I’ve been needing slippers for a while, and something came up in my Pinterest feed that made me realise it would be a great idea to try crocheting slippers! My current slippers are worn out, and the reason I haven’t replaced them is because they are my forever slippers. 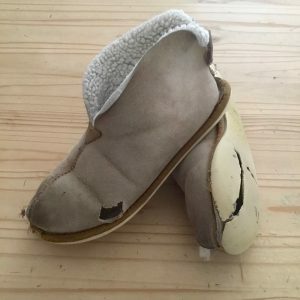 As soon as I bought them – eleven years ago when we could afford such things – I knew I’d found the perfect slipper, and nothing else would ever be good enough again. 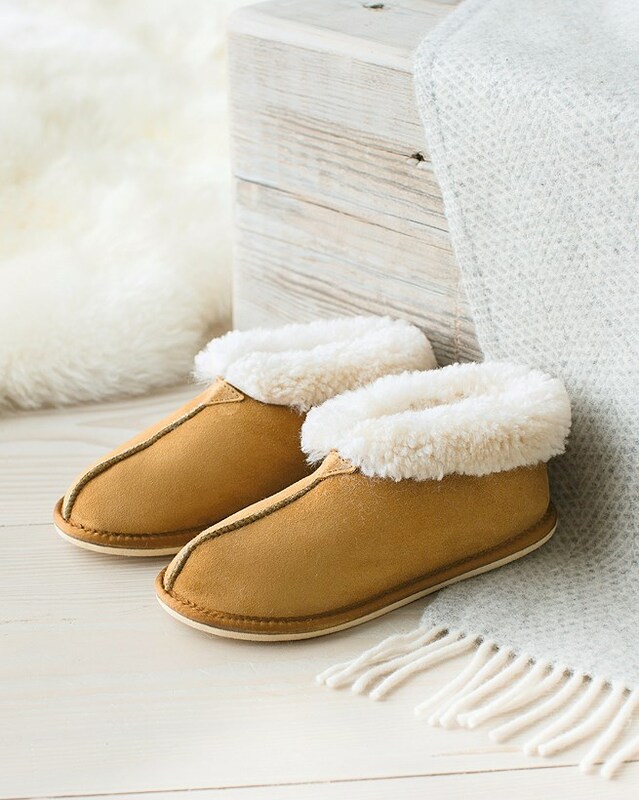 They are these sheepskin booties by Celtic & Co. 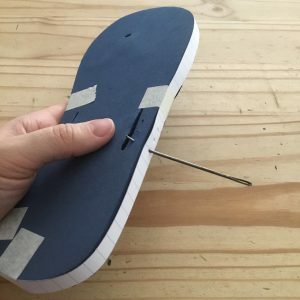 They have a proper sole for trips out to the bins/washing line, and they come up high enough to keep you warm around the ankles and not flap about. They are also made in the UK and Celtic & Co has an admirable approach to sustainability. 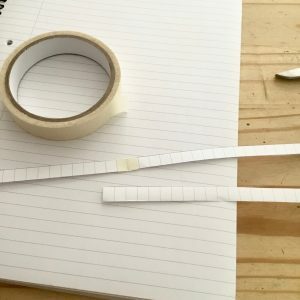 If money were no object, I would order another identical pair in a heartbeat – possibly in one of the many different colours. And they are totally worth every penny if you consider how long they have lasted under heavy daily wear. I’m not sponsored by Celtic & Co or anything, I just *really* like their slippers. I feel very strongly about slippers in general, as you can probably tell. My feet are always cold. Always. My husband tells me the only time my feet have not been cold was when I was pregnant, but then I was too sick to appreciate this aberration. And when you’re skipping meals, and you can’t afford to turn the heating on, I can tell you warm, comfortable feet are beyond price. But they are now letting the water in when I pop out, and I daren’t give them their periodic wash for fear of killing them. Maybe if I’d given them a stitch-in-time (or gaffer tape) a while ago, I could have extended their life a little, but I was just too busy wearing them. 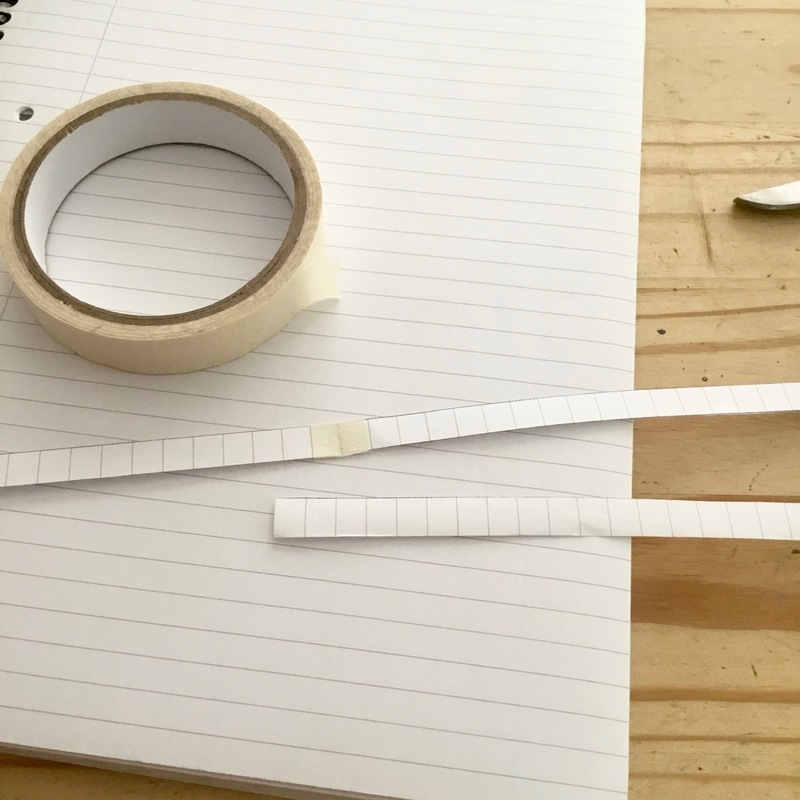 Now there are some similar things out there that our budget might now stretch to, but when you can’t have the real deal, sometimes a poor replacement just makes you sad (applies to quality chocolate vs cheap chocolate, for example!) 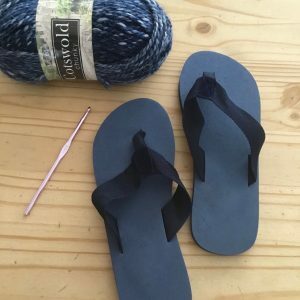 So when I saw in my Pinterest feed the idea of crocheting slippers on to flip-flops, I suddenly realised I could make myself some new slippers cheaply, that featured exactly the features I wanted – waterproof, non-skid sole, tight enough around the ankle – and even when not quite perfect, handmade *always* makes you happy! 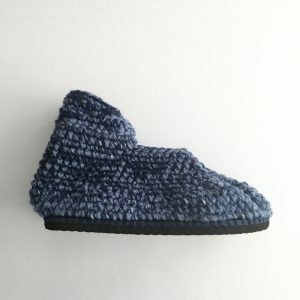 I’ve made slipper-socks for the children before, but it’s this cheap method for the sole that makes it a practical option. Like any a great idea, it’s obvious once someone suggests it! The particular pattern I have been looking at is this one by Jess of MakeAndDoCrew. She clearly knows her method inside out, and her instructions are admirably approachable, even given the inherent variability of this project that means not everything can be specified as in a normal crochet pattern. So I went on the hunt for some suitable flip-slops (Jess gives excellent advice) and found some in Poundland. (On a side note, I must ask Poundland why these flip-flops are not suitable for me, a *girl*. Will the colour upset my weak, female psyche? #letclothesbeclothes). And then on a rare visit to a physical yarn shop, found myself some yarn to match. I couldn’t find any super-chunky (equivalent to Thick’n’Quick) that was affordable, and I decided that using these two chunky yarns held together would a) give me a nice-looking fabric and b) give me a good proportion of wool for warmth. 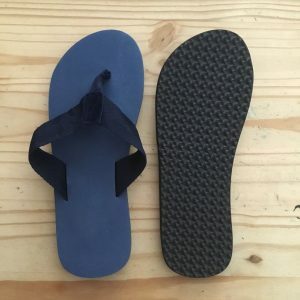 The flip-flops are very stiff, not at all flexible, but they do have the benefit of not having plastic posts that go all the way through to the bottom, requiring plugging, and the fabric straps were easy to cut off without leaving anything to irritate my feet, so that worked out well. To space the holes around the sole, I taped together strips of lined paper with 8mm spacing. Amongst the assortment of weird-and-wonderful sewing equipment I inherited from my great aunt, I found a sharp, curved (upholstery?) needle, which worked perfectly for poking the holes. I ended up with 77 and 78 stitches in the foundation row, which I worked with an oddment of ugly navy cotton DK from my stash. This is about 10 more stitches than expected in the pattern, so I used decreases over the next few rows to shape the base of the slipper around the heel and instep. My intention was always to make ankle boots, not the long boots given in the pattern, and with no buttons. I just omitted the extra rows before working the shaping at the back leg and this has given a perfectly snug effect that I’m really pleased with. I decided to work both slippers as far as completing the back leg before working the front leg on both. 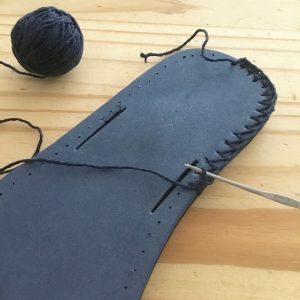 When it came to the pattern decreases over the toe area, the pattern is shown worked on the right-hand slipper, with the decreases between 11 o’clock and 3 o’clock. That makes sense, but the suggestion that the left-hand slipper should be worked exactly the same just doesn’t compute with me. It would upset me so much I would be unable to wear the things. 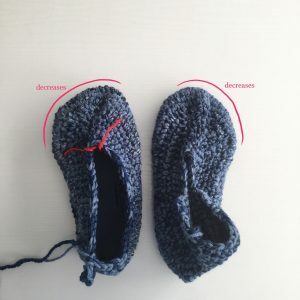 So for the left-hand slipper, I mirrored all the decreases (both mine, and those in the pattern) so the toe decreases are worked between 9 o’clock and 1 o’clock. I’m about to start the back leg section on the second slipper, but – isn’t it always the way – I have run out of the King Cole yarn. On going back to the yarn shop, they had of course sold out – isn’t that always the way – but that has turned out to be a blessing in disguise, as I have purchased a second ball online for much less. I don’t begrudge the price of the first ball, because I needed to see the yarn ‘in person’ but I can’t really afford to spend any more on this project – I’m hoping the Wendy Mode lasts the distance! 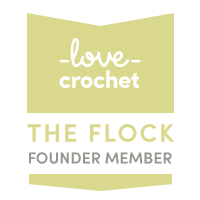 So I’m currently awaiting my yarn delivery – look out for Part II of my crocheted slippers soon! 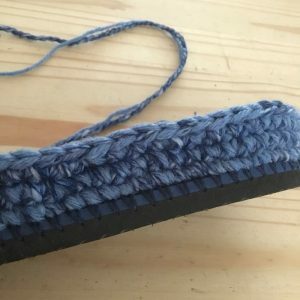 Click here to see the continuation and the finished slippers: Crocheted Slippers – Finished!